It’s been said that variety is the spice of life so, with five different shanks available, along with a customizable halo, tiara, lacework and French beading, the engagement ring semi-mounts of Verragio’s Venetian collection are pretty spicy! All components are available in white, rose and yellow gold. The engagement rings have a vintage vibe, thanks, in part, to its intricate lace-pattern profile and delightful detail at the Verragio crest. This is bridal jewelry that evokes an artful tradition, as seen in the design’s deep, acute-angled points. 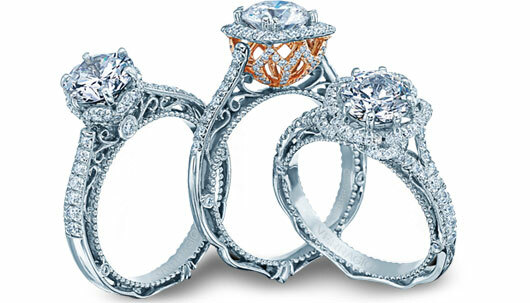 You’ll be proud to own a piece of wearable art from the Verragio Venetian collection.